Washington Should Listen to Texas - Help Tell Them! The Republican Party of Texas (RPT) Chairman Steve Munisteri has sent an open letter to U.S. Congress Speaker Boehner, expressing Texas’ GOP grassroots’ extreme disappointment with the recent tax-and-spend-but-no-spending-cuts “deal” cut with the White House. He also encourages the GOP Washington leadership to stand stronger against further “fiscal irresponsibility”, referring to the debt ceiling and tax debate starting already. Please take a few moments to call your Congressman, Senator, and Speaker Boehner to encourage them to stand strong for free market solutions and bona fide reductions in spending. ANY future negotiating with the Democrats, either in the Senate or the White House, must be done in front of C-SPAN cameras after this disastrous and irresponsible “fiscal cliff” scheme was negotiated secretly. Texans of all walks of life abhor backroom secret deals, big government, budget mismanagement and penalizing success. Chairman Munisteri’s letter is reproduced below and can be found at http://bit.ly/U9HfH6. 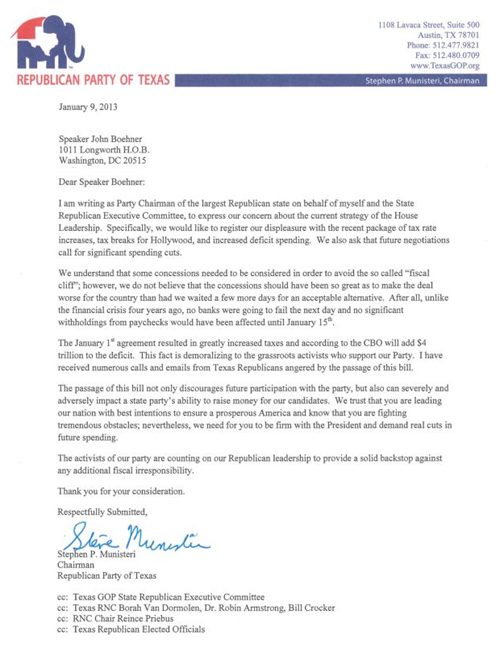 In consultation with the State Republican Executive Committee, Chairman Munisteri has sent a letter to Speaker Boehner on behalf of the Texas Republican Party urging him to insist on significant spending cuts as part of any future agreements in the House of Representatives. The Chairman and the SREC felt it was important that the Speaker of the House understand that the Texas GOPs ability to have electoral success is dependent on policy success both at the state and national levels. The leadership of the Texas GOP felt it important that the Speaker understand that average grassroots activists are counting on a Republican House of Representatives as a backstop to constrain out of control government growth and spending. Chairman Munisteri stated after releasing the letter that “at this point, what is done is done, so I personally am not so much interested in assigning blame as I am in preventing any further missteps by House Leadership. 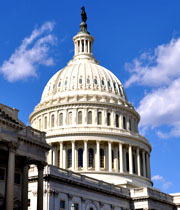 I felt it was important to let the Speaker know that going forward, we expect the Republican led House to draw the line against the tax and spend policies of the Democrat led Senate and White House, and to be a strong advocate for responsible spending cuts and effectively deal with an outrageously high federal deficit. I am hopeful that House leadership will get the message and that together all of us can work toward reducing the size of the nation’s deficit."